Hello; I'm just getting to update some posts now. But here are some. Enjoy. I have been thrilled with the results that people in our group have been creating. It is amazing the effect of the images, but also, the bond it creates when we respond to anothers image. The images are not in isolation - but connected. It is really neat. 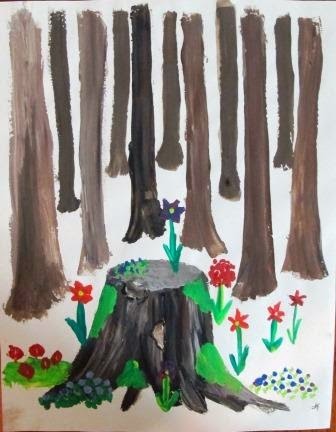 Vicky says: In brief, this image is, on the surface, about growth. The intention was to pursue the concepts of freedom and containment. The use of a contour drawing allows for fluid play with the colours within each section. However, the spaces were fairly small and the brush not holding enough water. 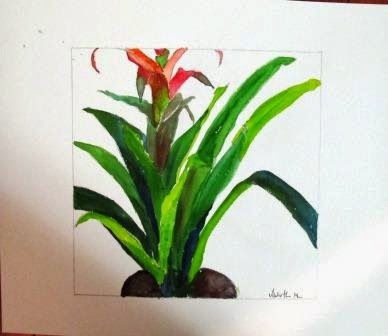 What should have been a calming experience became frustrating as I realized that my fine hand coordination has diminished significantly since I last painted in watercolours. The end result still pleases me and brings back memories of mindfulness practices with my watercolour instructor years ago. I enjoy the contrast created by keeping the background white. 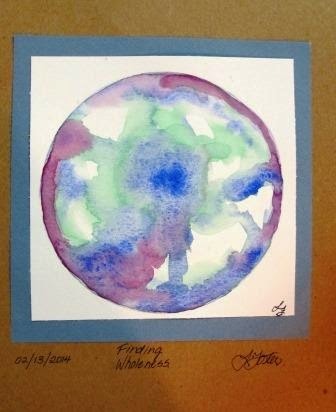 Laura F. says: This is a mandala, using a "wet on wet" watercolour approach. It is a very loose approach that allows the colour to flow and take on a bit of a life of it's own…I found it to be a calming meditative aproach, a way to learn to trust the process. I responded to Vicky's image of the Bromeliad. Her mention of growth and change made me think of a theme in my current development. The idea of Beauty growing, miraculously, from the old. Hence the beauty of muschrooms, moss and flowers the pop up from the old stump, bringing a spark of brightness to the forest floor. There is beauty and growth, even in all of us.